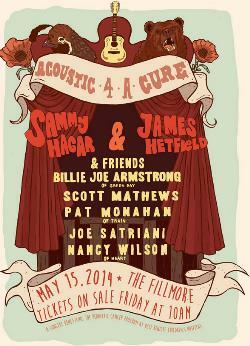 On May 15, the Fillmore in San Francisco plays host to Sammy Hagar's Acoustic-4-A-Cure concert to raise money for the Pediatric Cancer Program at the Benioff Children's Hospital. The Red Rocker has recruited Heart's Nancy Wilson, James Hetfield of Metallica and Green Day's Billie Joe Armstrong to lend their voices for the cause. Other participants in the first-time benefit Sammy hopes to turn into an annual event include guitarist Joe Satriani, and Pat Monahan from Train.